1 of 1 In a large bowl, combine turkey, bread crumbs, milk, 1/4 cup salsa, 1 tsp chili powder, cumin, salt and pepper. Form into 4 patties. Cook 3 minutes; turn, add 1 slice cheese to each and cook 3 additional minutes. Combine mayonnaise, 1/4 cup salsa and 1/4 tsp chili powder. 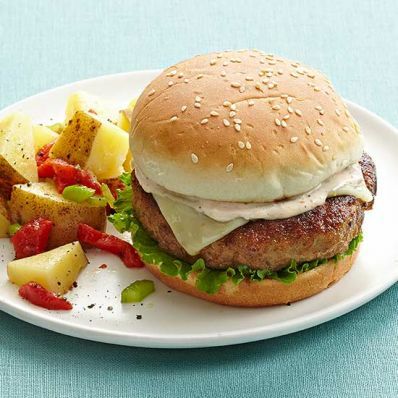 Serve burgers on toasted hamburger rolls with lettuce and salsa mayonnaise. Serve with Quick-Fix Potato Salad, if desired. Per Serving: 2 g fiber, 31 g pro., 466 kcal cal., 25 g Fat, total, 31 g carb.